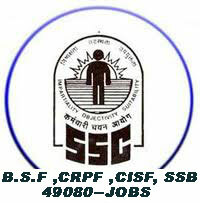 Staff selection commission (govt. of India)Closing date: 04.03.2011.Written examination--05.06.2011 Government of India Recruitment of constables in B.S.F,C.I.S.F,C.R.P.F,and S.S.B,2011. Govt.of India Commission will make recruitment to 49,080 posts of constable in the border security force B.S.F,central reserve police force C.R.P.F,central industrial security force C.I.S.F,and sashastra seema bal S.S.B..
Name of the Jobs (Government of India)--constables in the border security force B.S.F,central reserve police force C.R.P.F,central industrial security force C.I.S.F,and sashastra seema bal S.S.B. Essential Qualification (Govt. of India) Jobs--Minimum qualification is matriculation or 10th class pass from recognized board.Pay scale: Rs.5200-20200 + GP 2000. Application fees Government of India jobs--The candidates should pay the fee of Rs.50 by means of central recruitment fee stamps CRPF only.